« Day 1 & 2! 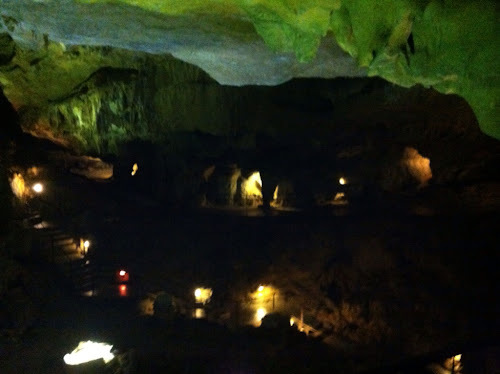 We ducked, climbed steps and explored our way through the miles or caves until we found a long boat and a little train to help us with the last section of the trip. In case you can't tell the photo is of the caves but with only a few lights and a camera on the phone we were a little limited. Many others got much better and clearer photos I bet you will all see when we get home. Lunch was lovely as ever and everyone is enjoying their food and eating really well but it's a little 'down time' so people are either catching forty winks or playing games and balloons in the hotel. To give everyone a little more of an idea of what it is like here if you have never been to Lourdes, it is beautiful. It's a very calm and welcoming place. Everywhere you go around the town, especially this week, all the smiling faces say hello. The patches of multi-coloured uniforms that blanket the view in every direction is a reminder if how many groups from all the different parts of the UK and from all over the world that are here and feeling the same feelings if belonging and happiness we all get from being here. Songs fill the air from the churches, bars and hotels as you move around the tight street and the shops are always bustling with life.